Myself and Nicola have recently returned from another exhausting city break to London. Before heading to the capital, I had spent hours each evening looking for new places to eat and drink, ever hopeful of finding a hidden gem or a local secret. In a weird twist of fate, Nicola stumbled upon a cool looking venue thanks to her employer using the meeting rooms at The Somers Town Coffee House for staff training. Nicola had to arrange for training supplies to be sent to the pub and after a few emails back and forth to make sure that the training went to plan, the Events Manager Alex, invited us in for dinner if we had time on our impending trip. We arrived in London just after lunchtime and after a quick check-in, it wasn't long before we were enjoying our first drink of the weekend - swinging by the Charlotte Street branch of cool mozzarella bar, Obika. Drinks in Soho and Carnaby Street soon followed before it was time to head back to the hotel to get changed for dinner. Already running a little late at this point of the evening, a quick phone call to Alex confirmed our imminent arrival. The Somers Town Coffee House sits equidistant from both Euston and St Pancras/Kings Cross train stations and if you didn't know about it, I think you would struggle to ever find it. The Somers Town was originally built as a coffee house in the 18th century and it attracted intellectuals of the times who would write and debate whilst getting their caffeine kicks. After a transformation to a more conventional pub in the 19th century, The Somers Town Coffee House continued to serve drink for hundreds of years to the locals of Kings Cross and many a weary traveller alike. 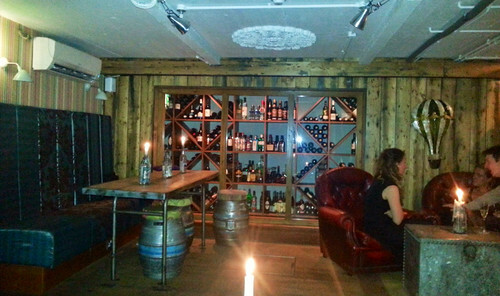 In late 2011, the business was under new management, part of The Yummy Pub Co, and given a refurbishment and relaunched as more of a 'gastropub' with a big emphasis on serving quality food in addition to the huge array of beers, wines & spirits on offer. After an initial mix-up when the new waitress tried to seat us outside in the empty beer garden, we were shown to our table. Had we taken a proper look about when we arrived, we would have seen our names scrawled across the varnished tabletop by way of reservation. 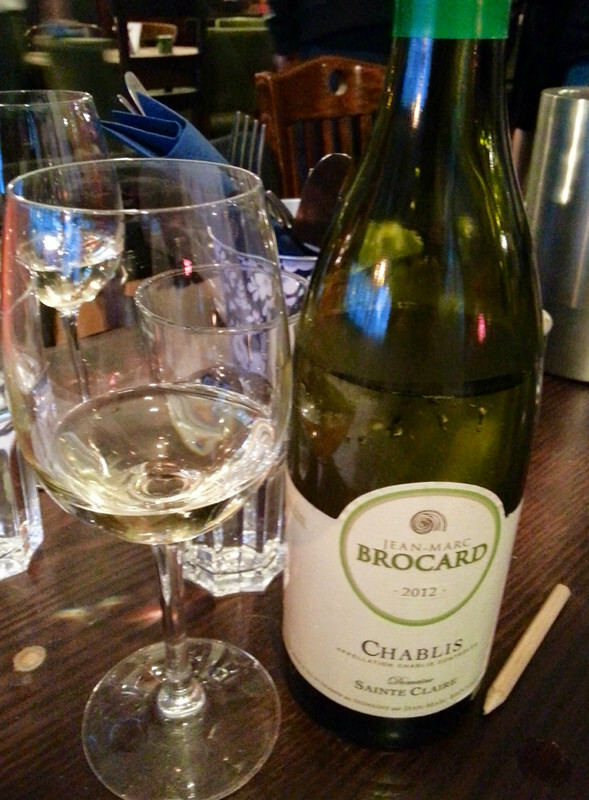 The food and drink menu is a simple affair that first need to be ripped for the pads that hang on the walls, and once we had our menus in hand, we were able to order a very reasonably priced bottle of Chablis. (only £16.95 which we found out later may be a typo) The wine list offers a decent range of both old and new world red, white and rose wines starting from just £15. For those wanting to drink beers, there is a huge range of international brand lagers, beers and ciders, plus an excellent selection of craft beers and cask ales. Whilst the food menu boasts a good selection of starters to share or nibble with drinks, and a hefty choice of large plates mains (fancy pub grub), but what had previously grabbed our attention was the British Tapas section of the menu. We love tapas and love British pub food, so it stood to reason that we should enjoy our British Tapas. To keep things interesting, the tapas dishes are changed every twelve weeks. We are both huge fans of tapas. In fact, if every meal could be a selection of small plates or buffet type affair, then we would be in a constant state of contentment. The menu suggest that you should order 3 or 4 tapas dishes each to share but as we are seasoned pros, we know that we can get by with a combined total of 5 or 6 dishes and be suitably stuffed. 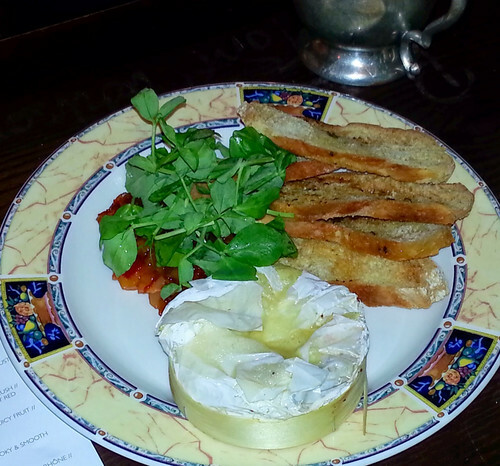 Each tapas dish was brought to the table when they were ready, the first being the oven baked Camembert. Hot, molten, creamy Camembert with homemade garlic crostini for dipping, all served with a zingy sharp apple, cider & chili chutney. 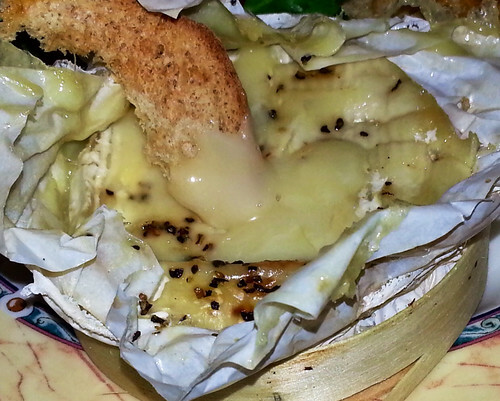 Baked Camembert is one of life's little treats, I really should do it more at home. We both loved dipping our garlic crostini into the gooey cheese and agreed that the chutney was a fantastic foil to the rich creamy Camembert. Next up was vodka and beetroot marinated smoked salmon. Exactly as it says on the tin! 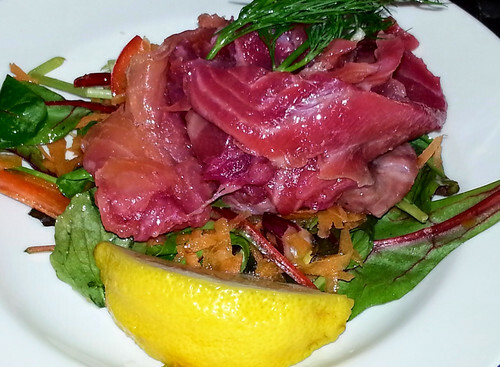 The vodka had started to break down the proteins in the fish, giving the impression that the salmon had been slightly cooked and whilst the smoked salmon tasted as I expected it to, the earthy flavour from the beetroot added another dimension to this tasty fish dish. The next tapas dish was my favourite! 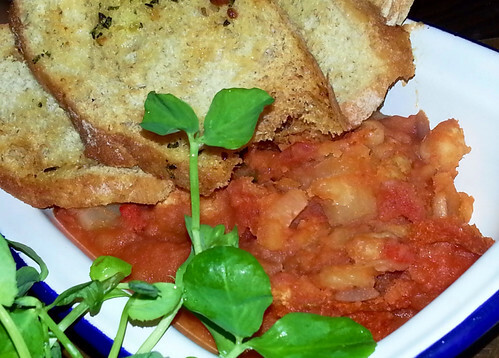 The chorizo, cannellini beans, patatas bravas was divine. This was a proper rustic dish that I could have eaten all night. Too many places somehow struggle to do simple things like patatas bravas, but the kitchen at The Somers Town have came up with a winner adding smoky chorizo and beans to the tomato-ey potatoes. My only criticism would be that I would have liked a little more chili heat, but that's just down to personal taste. Next up was cannellini bean and sweetcorn fritters. 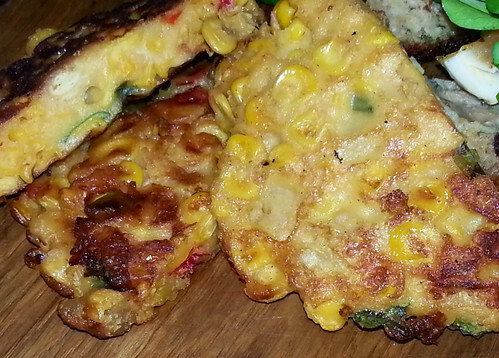 The fritters were well cooked, crispy on the outside with just the right amount of give in the middle. We both liked the fritters but agreed that they could have done with a little more seasoning. Our last dish created a lot of debate at our table. The menu describes this tapas dish as black pudding wrapped scotch egg so it's fair to say that I was expecting a scotch egg wrapped in black pudding. 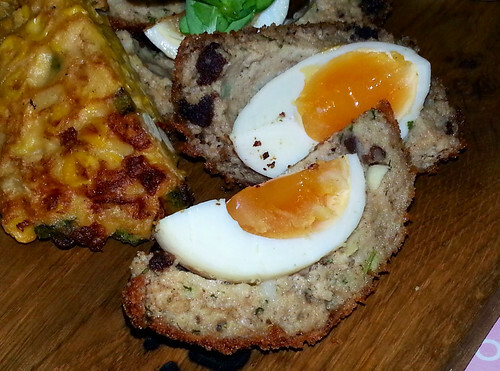 What we were served was perfectly cooked scotch eggs wrapped in a mostly well seasoned sausages meat with a little black pudding. I'm not complaining, the eggs were fantastic, but not enough black pudding for me. However, Nicola says that the balance was perfect and that the scotch eggs were her own personal favourite. Once again, we judged the number of tapas dishes perfectly - after the five dishes we were both feeling quite full. After dinner we were keen to see what the Cosy Kettle was all about. 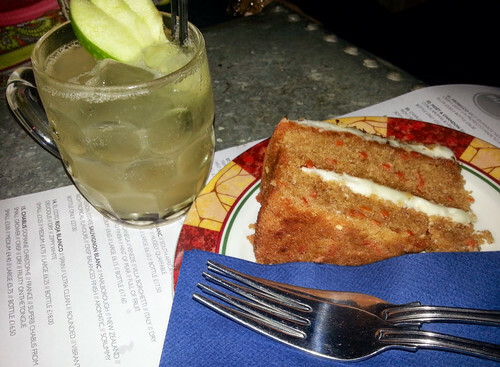 The downstairs bar only opened in December of last year but has already proven a big hit, serving up its trademark 'Cocktails & Cakes' in the funky speakeasy with a kitch twist. On the night there was a private party on downstairs but Ellie, the manager on duty, smuggled us downstairs and allowed us see if cocktails and cake really work together. The Cosy Kettle is appropriately named! The lowered ceilings, low lighting and randomly placed candles help create an intimate setting whilst the mishmash collection of leather armchairs, used beer kegs, wooden stools & chairs, and flowery patterned upholstery certainly pull in the kitch factor! 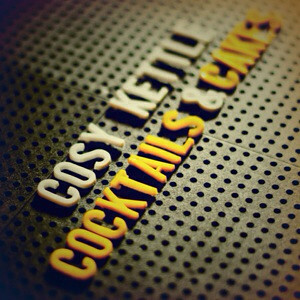 Cocktails & Cake is the war cry of The Cosy Kettle, an odd pairing perhaps but in the name of research we gave it a go. After dinner I wasn't in a 'cocktaily' mood so decided to stick to my preferred Cuba Libre, but Nicola had no hesitation in ordering 'An Apple a Day' and a slice of the 'Cake of the Day', which happened to be a really delicious carrot cake. (I did make sure to get two forks in order to help Nicola with the research) Nicola's cocktail was a wonderful vodka cocktail that tasted exactly like good old fashioned apple pie, and I'll be honest and say that I was slightly jealous. We had a fantastic evening at The Somers Town Coffee House. The food was great and the portion sizes were generous for the price. The staff, both upstairs and downstairs, looked after us very well and made sure that our time at The Somers Town Coffee House was enjoyable. When it came to settling up the bill for our food and drinks, the restaurant manager Ellie advised that our evening was 'on the house'. This review is a true representation of our evening and in no way swayed by the fact that our meal was comped, and I would like or extend our thanks to the management and staff at The Somers Town Coffee House for a great evening and look forward to visiting again on our next trip to Old London Town. 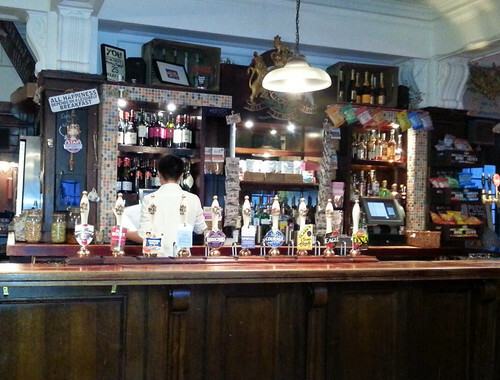 So if you're looking for good food, great value, and a huge range of beers and ales, then you would be doing yourself a favour by hunting out this hidden secret! 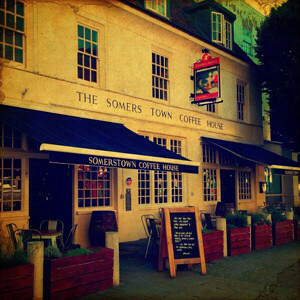 Keep up to date with the team at The Somers Town Coffee House on Facebook and Twitter.